Iritis is the swelling of the iris, the colored portion of the eye. It is a form of uveitis (The middle part of the eye is called the uvea. ), sometimes called anterior uveitis. Iritis is a serious condition that can lead to discomfort and impaired vision if not treated properly. If you think that you may have iritis, you should see an eye doctor right away for a proper diagnosis. Iritis and other painful eye conditions can have serious consequences if not treated in a timely manner. Some people may be genetically predisposed toward developing iritis. It may also be developed through eye infections, injuries to the eye(s), certain medications, and autoimmune conditions like juvenile rheumatoid arthritis and sarcoidosis. 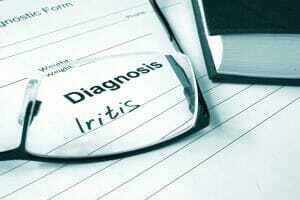 Recurring Iritis (that comes back over and over again) is most likely caused by a chronic disease or a genetic factor. Typical treatment for recurring iritis is corticosteroids. Corticosteroid has strong anti-inflammatory properties, but it can also damage the liver and kidneys in the long term and can cause osteoporosis. TheraLife Eye is a proprietary formula that improves blood circulation to the eye and fights inflammation at the same time. It will restore normal eye function, which may have been suppressed by the inflammation caused by iritis. TheraLife’s molecularly distilled Omega-3 Fish Oil also has strong anti-inflammatory properties to help you recover.